The mysterious stone labyrinths found in northern Russia may have been beacons for ancient sailors according to researchers. In early October 2014 the Kosmopoisk research expedition on the Kola Peninsula in northwest Russia, an area with five stone labyrinths, came to an end. Some of these archeological monuments date back to 2,000 B.C., meaning that they are older than the Egyptian pyramids. 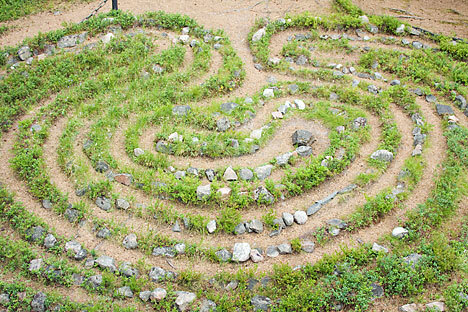 Traditional science links the labyrinths to northern peoples' religious outlooks. However, one of Russia's most well known researchers of anomalous phenomena, Vadim Chernobrov, the director of Kosmopoisk, is convinced that the stone patterns served as landmarks for ancient mariners. Where do these circles come from? The most famous labyrinth above Russia's polar circle can be reached by foot from the little town of Kandalakshi in the southern part of the Kola Peninsula, about 800 miles from Moscow. The path goes through a pine forest, with volunteers from a local ecological organization putting up signs so tourists do not get lost. The ancient builders chose a perfectly round peninsula for the labyrinths. The stone roads are now almost completely covered with grass and moss. There is a plaque declaring that the archeological monument dates back to 2,000 B.C., the only reminder of the site’s place in antiquity. These types of labyrinths, or Babylons, as scientists call them, are also found on the coasts of the White Sea and the Barents Sea, in Scandinavian countries and on the British islands. It is still not clear why they were built and scientists are divided on the issue. Some think that the labyrinths were used in shamanistic rituals, while others are convinced of Babylons' utilitarian nature: they could have been traps for fish or orientation points for seafarers. "The sailors had to place marks on safe plots of land," says Chernobrov. "And it was even more important to indicate the place where they could push out from the coast towards the open sea. In antiquity, fearing storms, mariners tried to navigate along the coast, but in many places it made sense to shorten the route through straits, gulfs and the open sea. The labyrinths were points of a guiding thread, leading the navigators along the coast. In order to prove their theory, members of the expedition used geometric constructions that determine how far the labyrinths could be seen from the sea. Chernobrov believes that the labyrinths were intentionally given a round form so that the pattern could be seen at a distance of several miles independently of the sun's position during the entire polar day. During the expedition researchers frequently noticed that the labyrinth is never found in the shade of cliffs or trees and that the sunlight always makes it stand out if observed against a gloomy landscape. It is even noticeable when covered with moss and lichen. Even in the winter, when covered by a thick layer of snow, the pattern can be seen clearly. Kosmopoisk's version of events is not considered mainstream in scientific circles. Most scientists believe that the Babylons were used by ancient peoples for religious rituals, such as when appealing to deities for an abundance of fish. The round patterns could have been guides into the kingdom of the dead or for detaining the soul of a deceased person so that it could not enter the world of the living. Scientists say that the version about the labyrinths being beacons is not scientific. "Can an exponent of this theory name at least one historical reference in which a real mariner reported how the labyrinth helped him orient towards land?" asks Konstantin Kotkin, researcher at the Murmansk Region Local History Museum. "Most likely not. I am not familiar with these sources. And science is supported precisely by this type of information." There is another version in the documents describing the labyrinths. Since the Babylons were built next to the sea in places abundant with fish, they could have been used as traps. The fish could have been brought into the confused patterns with the flow of the tide and then might not have been able to find their way back as the water ebbed. However, this theory also has not received much recognition. According to Kotkin, in order for ancient people to feed themselves in this manner, it would have been necessary to build an enormous number of labyrinths with one at each location where fishermen threw out their nets, which is difficult to imagine. Another debatable question is the date of the labyrinths. Scientists in the middle of the 20th century estimated them to be 4,000 years old. Contemporary researchers, however, say that the stone patterns are much younger. They determine their age by the height of the lichen growing inside the labyrinths. Unfortunately, no one has any concrete proof. "Science is incapable of unequivocally solving the problem of the age or the purpose of the labyrinths," says Kotkin. "The monuments don't tell us anything about themselves and it is very difficult to prove any of the theories. Therefore any one of them is as good as the other. It is important that the theories are supported by real facts. However, all in all, without a doubt the labyrinths are valuable archeological findings that demonstrate the uniqueness of the Russian North."